The dead of winter is a great time to get things in order if you're a gardener. 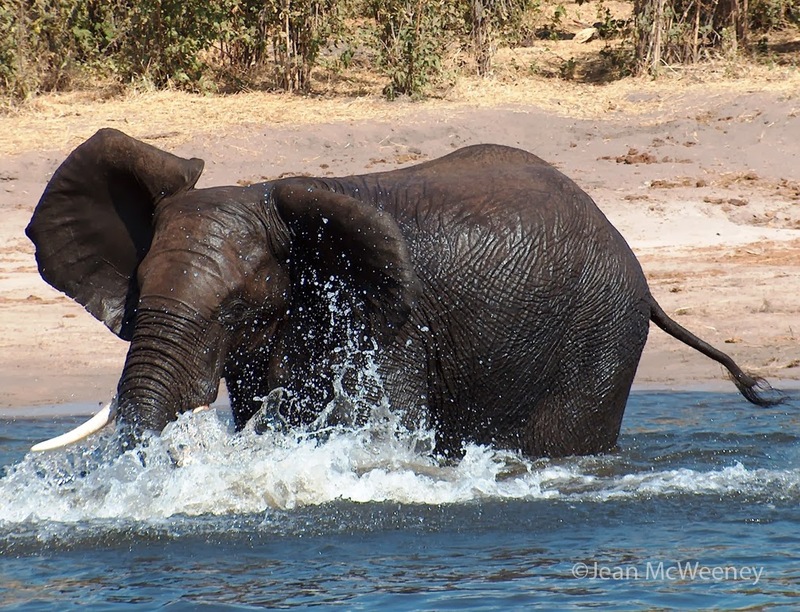 One of the things I have been meaning to do for a long time is post about our trip to Botswana on a photo safari. It's as much for me as anyone since I'm quickly forgetting many things about the most fantastic trip I've ever taken. 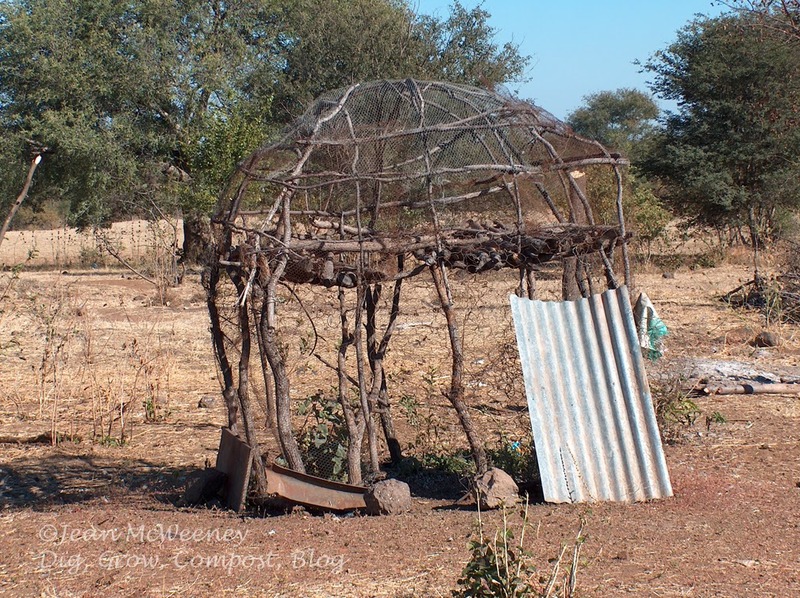 So when Pam at Digging started posting about some of her great trips, and especially her trip to Tanzania, I was inspired to get on the ball and do it. This trip was the result of a lifelong dream and interest in animals, as well as a switch to a new company where I received a signing bonus. Instead of doing what my normally frugal self would do and socking the bonus away, I decided I wasn't getting any younger and now was the time for this trip. I started planning it in 2003 and then at the end of May, 2004, we were off. 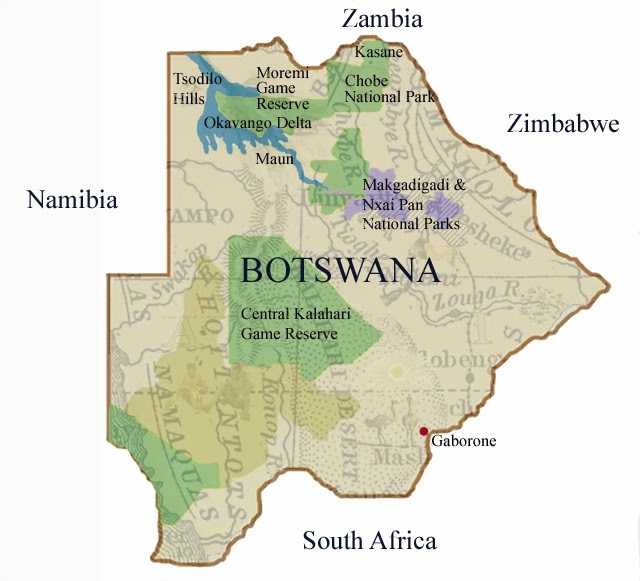 We were to visit three areas in Botswana for 4 days each, but arrive and depart the continent through Johannesburg, South Africa. 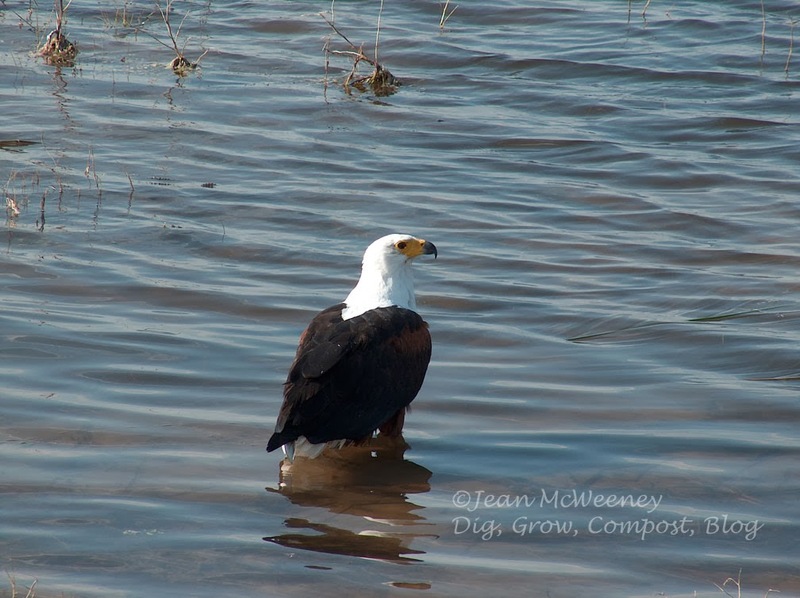 These three areas were diverse enough from each other that we should see an interesting mix of wildlife. 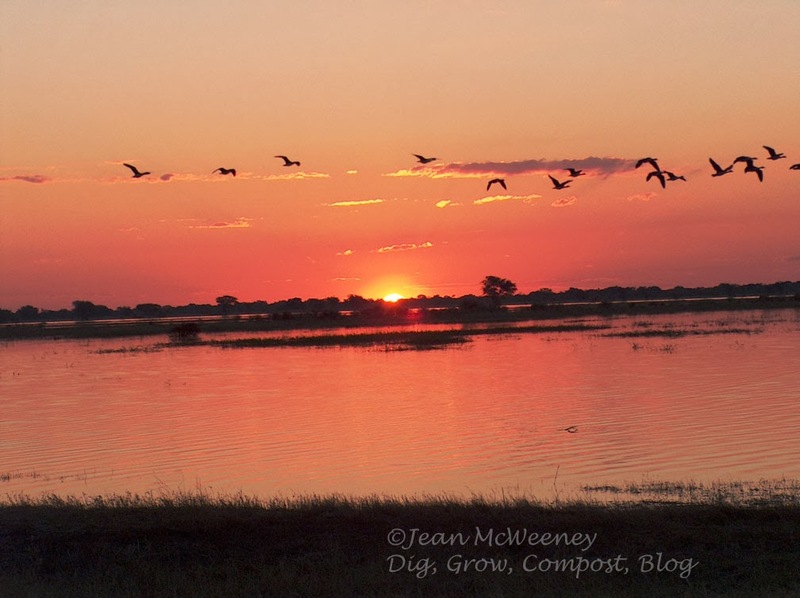 In this post I'll talk about Chobe National Park, our first stop. 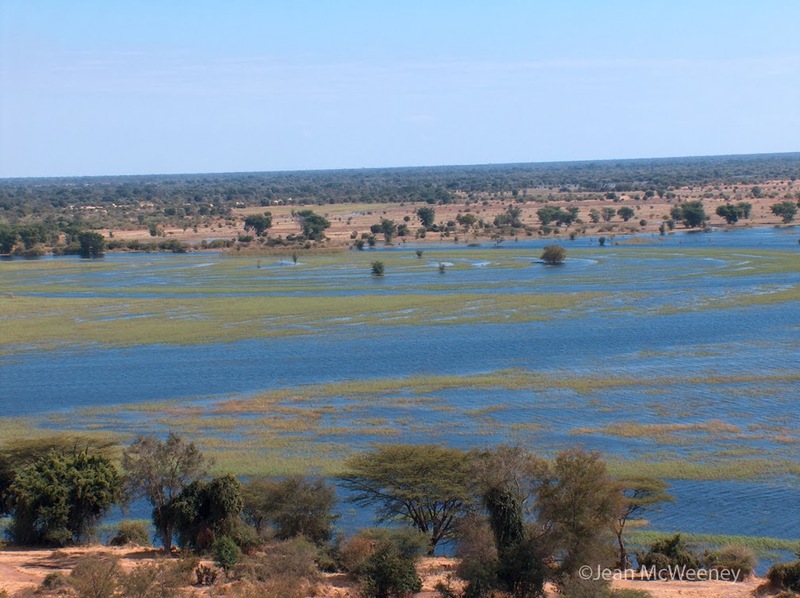 I posted about Chobe National Park here in 2009 when Pam did a blog meme about national parks, but I'll give you some more details now. 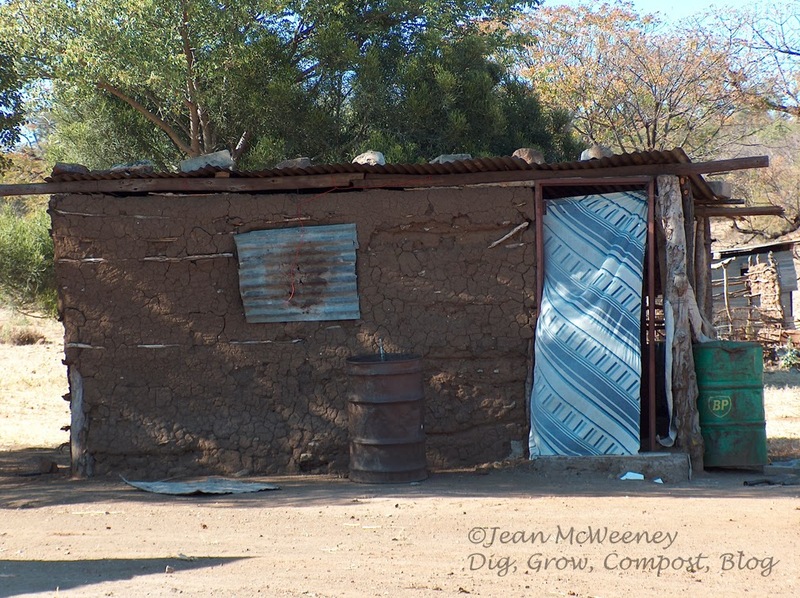 First about Johannesburg - it is a big, vibrant city but we only saw a smidgen of it, and it was the well-off area, too. My first impressions were that they had some cool looking aloes growing everywhere and that I wouldn't want to live behind razor wire as I saw many people doing. 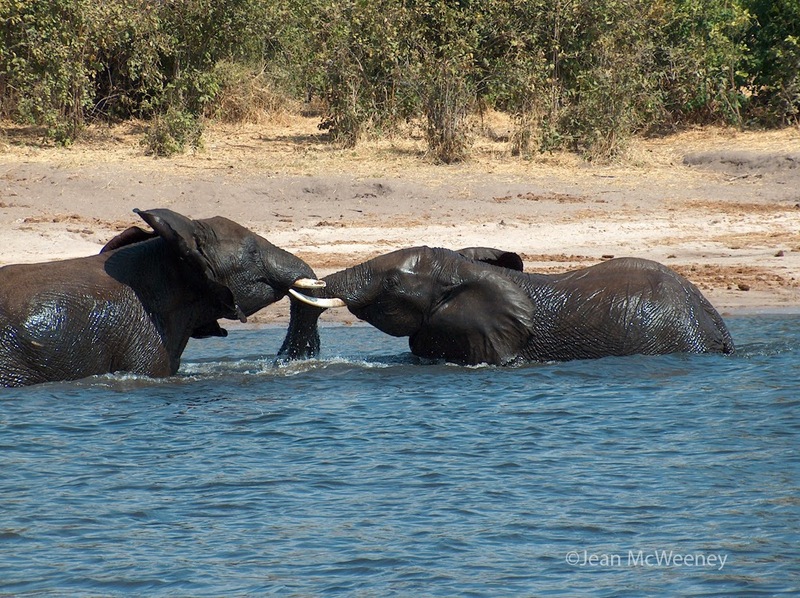 But we only had one day and night there before we flew to Kasane, Botswana, to see Chobe National Park. 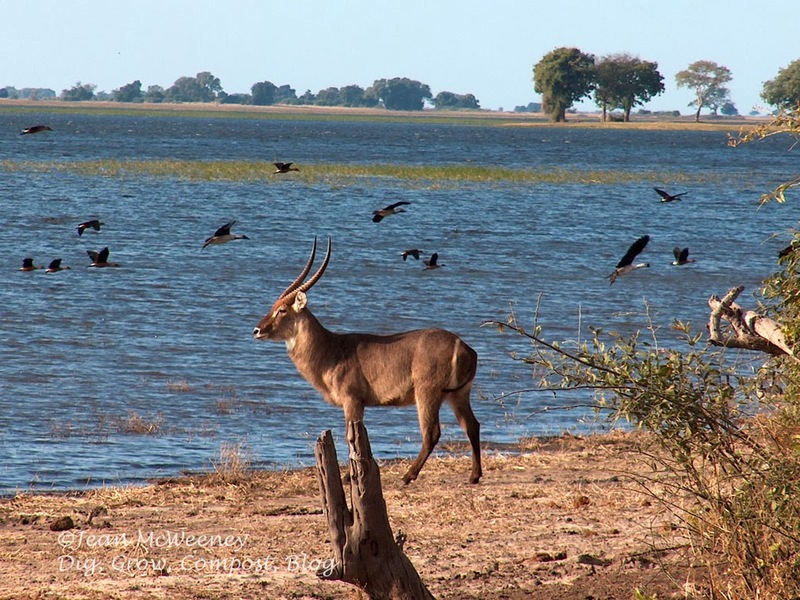 The Chobe area is in the northern part of Botswana, close to Victoria Falls and just across the Chobe River from Namibia. 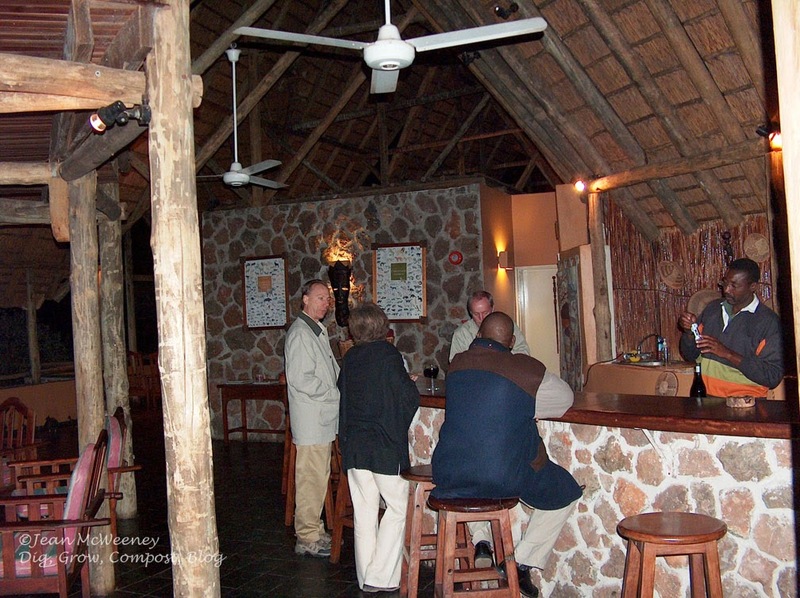 We arrived at Kasane expecting to be picked up by staff at the lodge we were to stay at - Muchenje Safari Lodge. But because of a last minute change from another lodge (due to Air Botswana cancelling flights from there), the staff was told the wrong date of our arrival. Not to worry, with the help of folks at the airport we figured out how to call them and they immediately came to pick us up. It was a blessing in disguise because it turned out only two other people were at the lodge at the time so we had the place to ourselves. 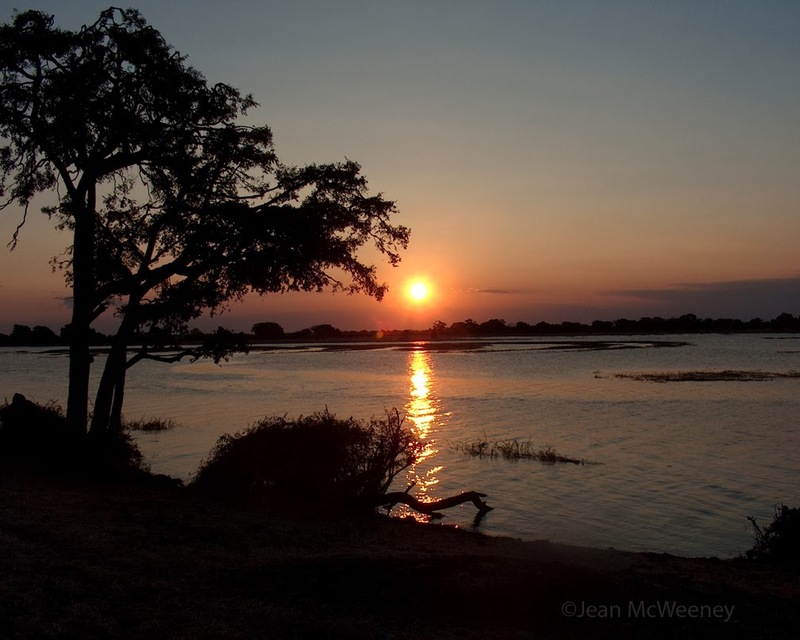 You may assume southern Africa is always hot and dry but we were there in Botswana's late wintertime when the rivers and watering holes were still pretty full and mornings and evenings were very cool. The afternoon of our arrival we immediately left for the bush. 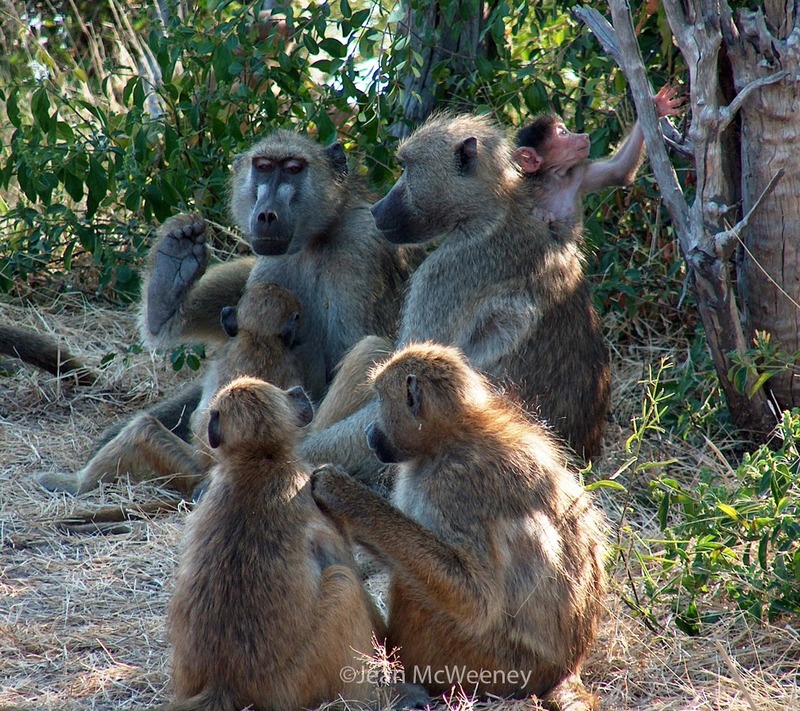 My first intention was to see baboons in the wild (explained in my 2009 post about Chobe), and so our guide, Gordon, made sure to accommodate that wish. We had the most patient couple in the jeep with us. 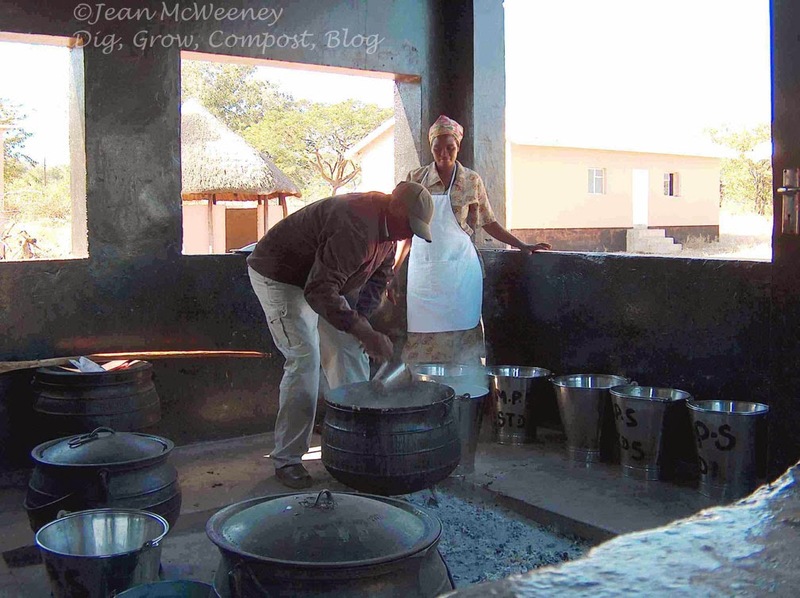 They were an elderly couple from England who had been to Africa several times. They let me sit as long as I wanted with the ubiquitous baboons. 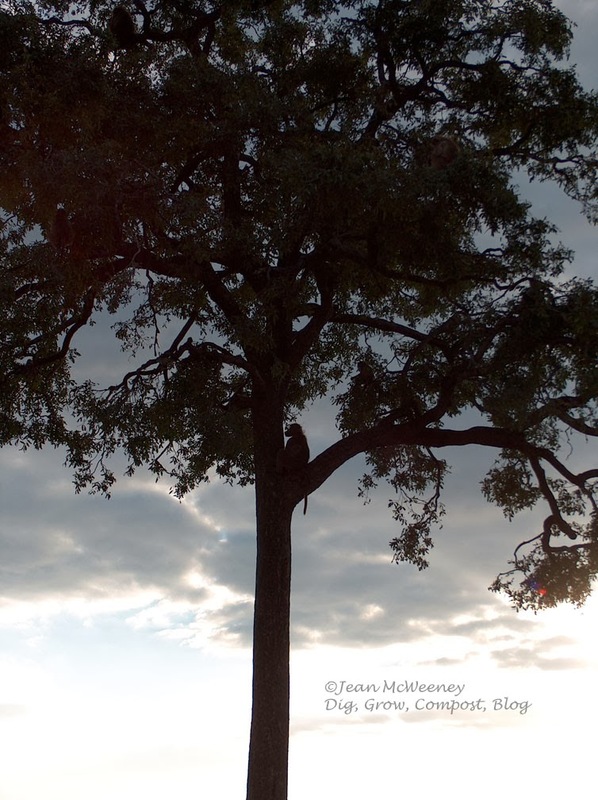 One tradition on safari is having a "sundowner." That's when the guide pulls up to a scenic (and safe) place, pulls out some snacks, and fixes everyone a cocktail. This photo is of our first sundowner. I'll remember it always. 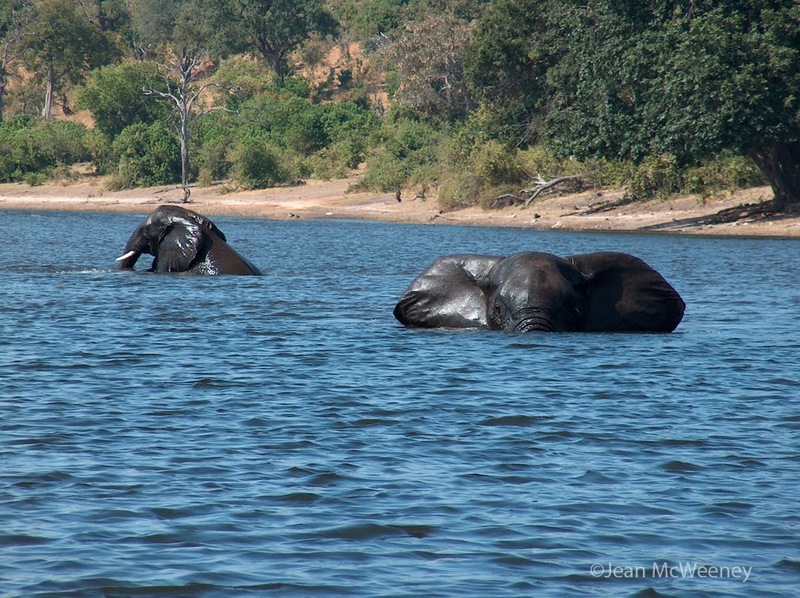 We saw a bachelor herd of young elephants playing in the water. Pardon me if you're already read this in my other post but it was magical. These large beasts were thoroughly enjoying themselves. Imagine being as large as they were yet treading weightless in the water. And quiet! All we heard was water splashing. I could have stayed watching them all afternoon. But there was much more to see. Such as the crocodiles on the little islands in the river. And the hippopotami along the banks. 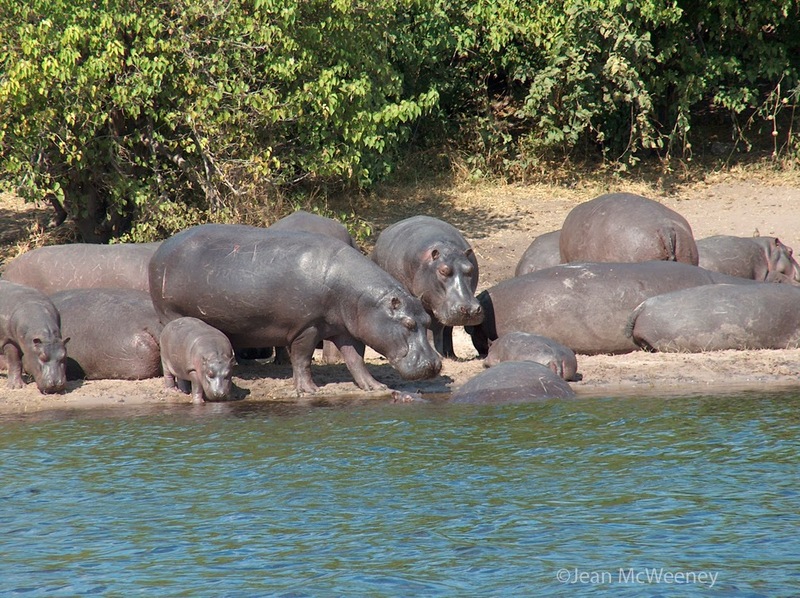 One thing we learned - never get between a momma hippo and her baby. You most likely will not survive. 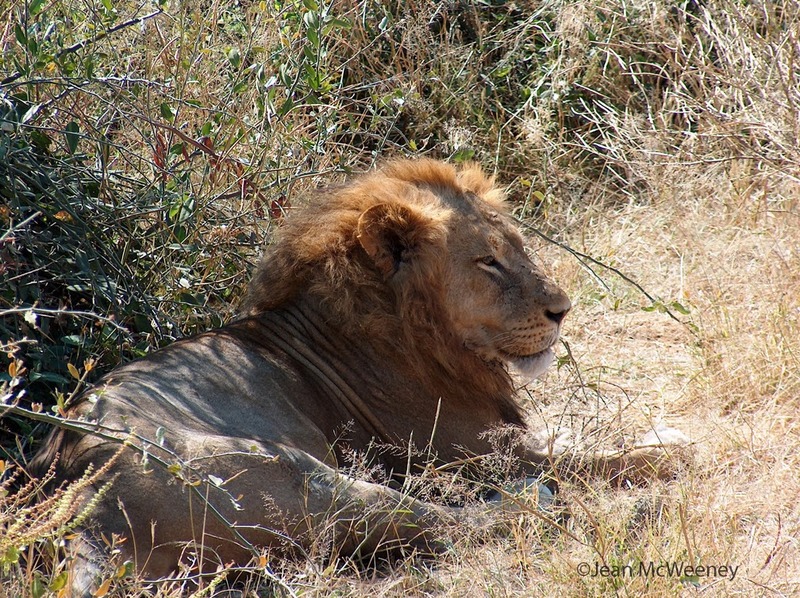 Once we got on land again we saw another first - our first lion. This male was consorting with a female, who quickly took off when we saw them. 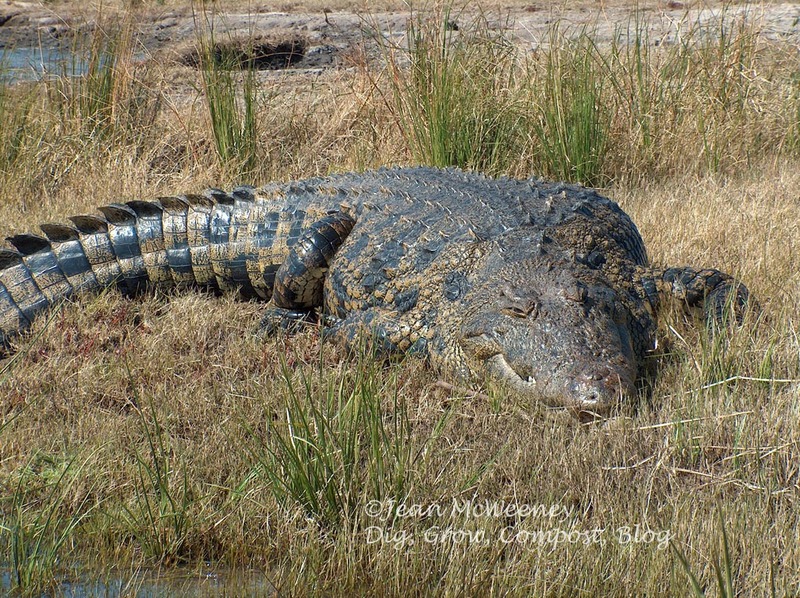 We named one of our cats 'Chobe' after this guy. 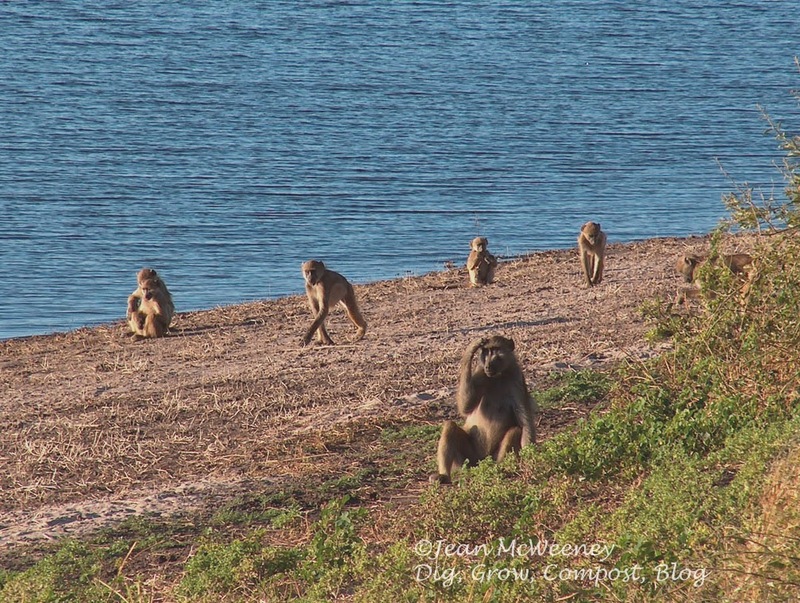 A little before sunset we saw a troop of baboons heading down the beach. They were on their way to settling down for the night. It's always a good idea to sleep where the predators can't easily get to you! 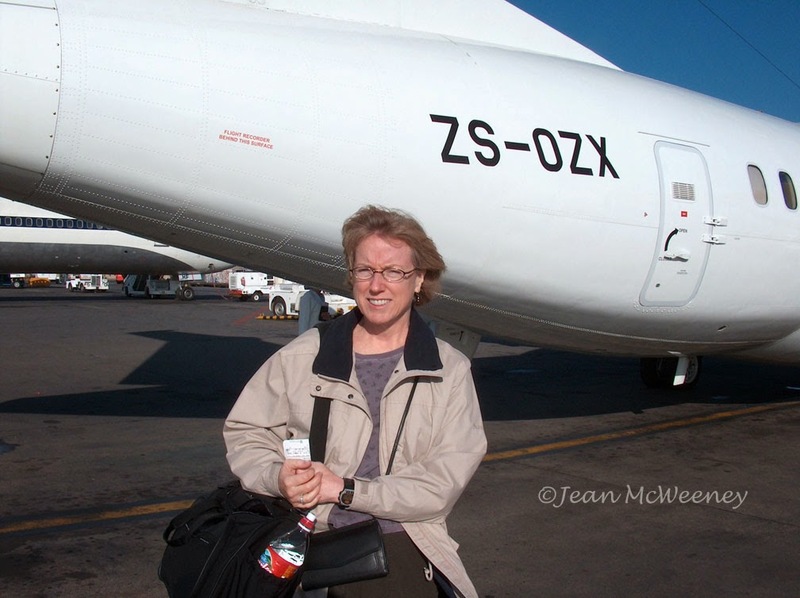 When we arrived in South Africa, I had contracted a horrible cold. I was too excited to let it stop me but I gotta say, I was not feeling well. I was encouraged to start having gin and tonics (or g-and-t's as they're called) at our sundowners in order to break the cold's spell. It worked. One morning we went on a walk with our guide. 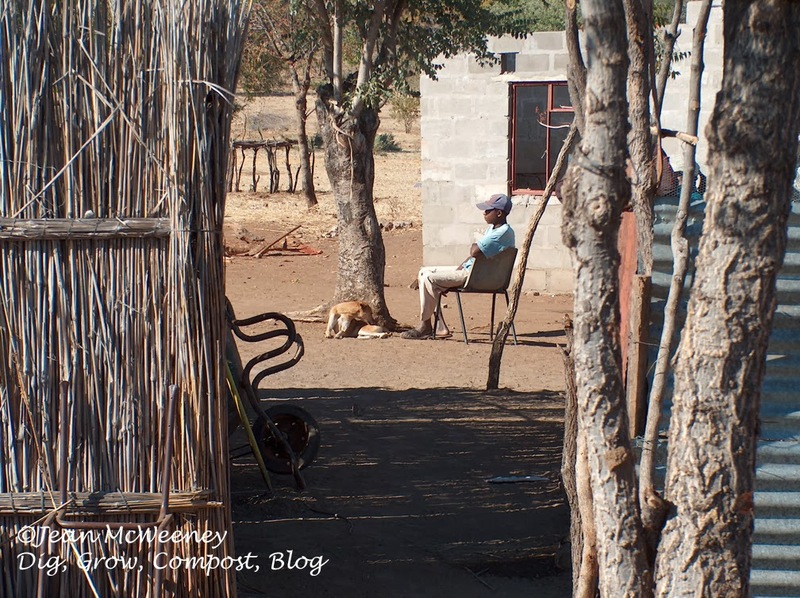 We started out right near the lodge to see what the elephants had been up to the night before (we urban gardeners shouldn't complain - they had elephants tromping through their vegetable garden). When one goes on a walk in the wild there, one carries an elephant gun just in case! The cool thing about walking is that you can see up close what is easily missed from a jeep, like this dung beetle. 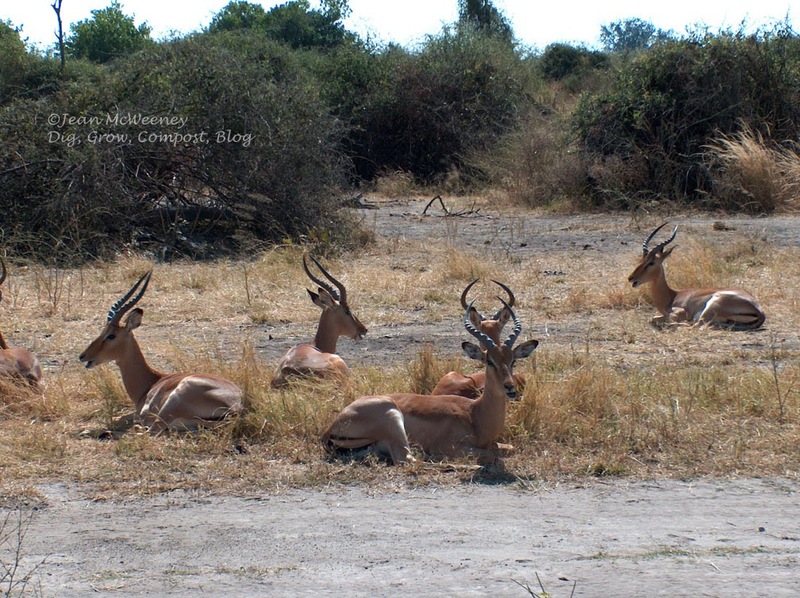 Impala were everywhere on our trips. Our guide explained why they call them "McDonalds" - they have "M's" on their rears and they're as ubiquitous as McDonalds is here in the states! That's okay, I still enjoyed it every time I saw them. One day we were taken on trip to learn more about the people in the area. 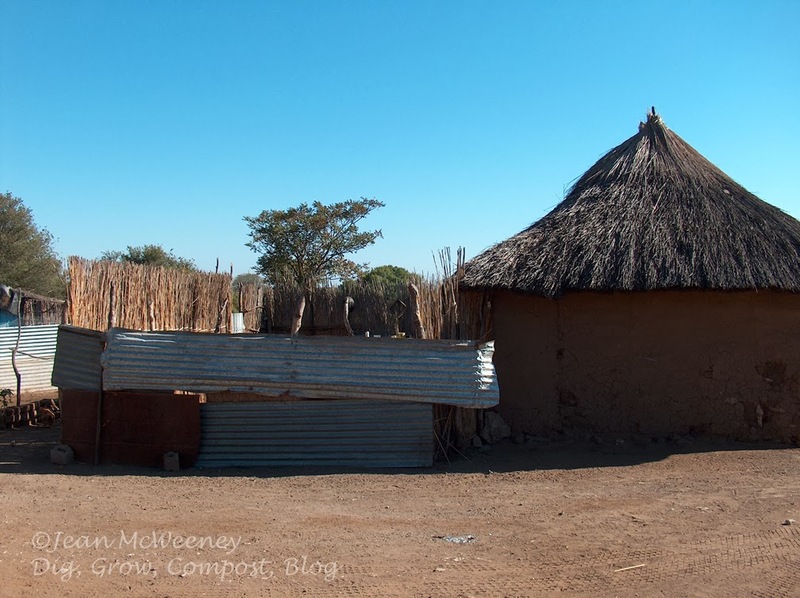 We visited a village outside the lodge, though to my eyes it looked more like a compound for an extended family. Unfortunately the families were away on other business at the time, only a grandson was there to greet us. Life is very basic here. I'm sure dwellings such as this have to be repaired frequently. Isn't this a lovely pot? This is how they keep their chickens safe at night from predators. 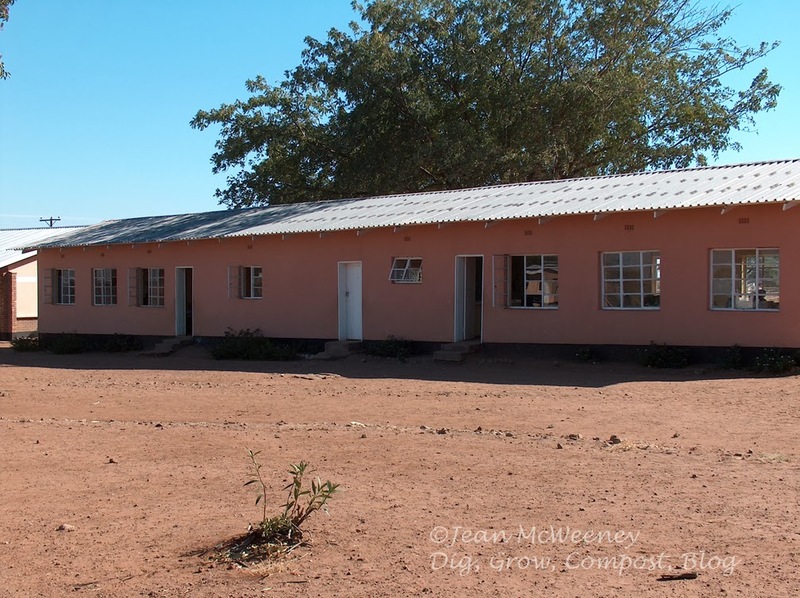 Next up was a visit to Mabela Primary School. 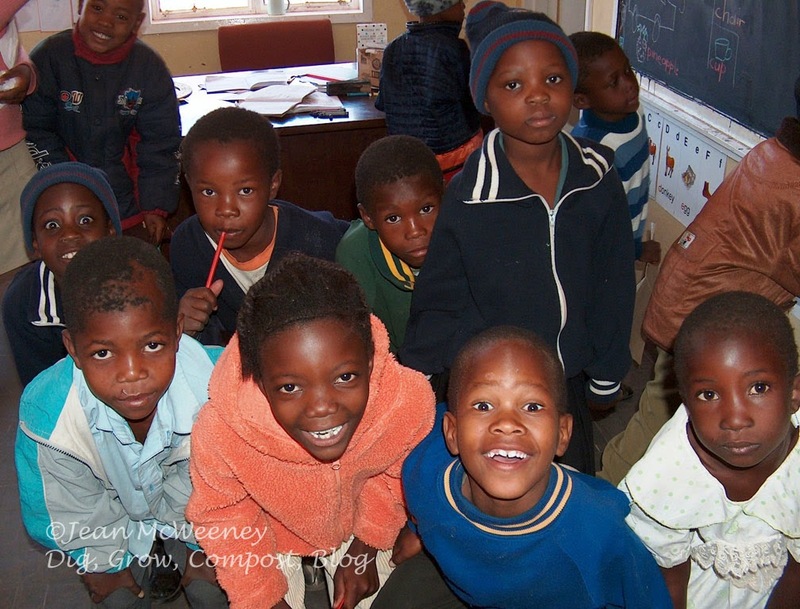 Education in Botswana is free for as long as you want to go, including a PhD! Of course, the reality is that poverty still gets in the way of many people's dreams. But the first president of Botswana, Sir Seretse Khama, reinvested much of the wealth from diamonds into health and education programs, transforming the nation into a southern African economic success. 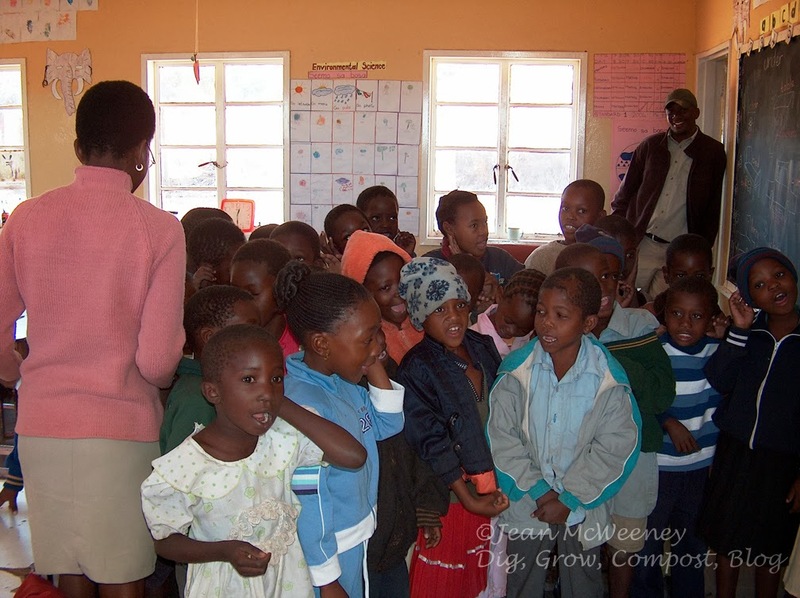 The children sang a song of welcome for us. That's our guide, Neo, in the back. The kids had fun looking at themselves in my digital camera after I took photos. Here's Neo "helping" fix lunch, which is a mixture of beans and corn porridge. I think he was really just flirting! Muchenje Lodge was a beautiful place and we had a great time getting to know the managers and guides since we were the only ones there for a while. One of the guides and the two managers were from Zimbabwe, and they spoke longingly of their home country. Unfortunately it's still in bad shape. Our last day at Muchenje meant another early morning game drive before a tiny plane would take us to our next destination. Waterbucks were numerous and they are quite majestic looking. Sable antelope were even neater looking and we were told this was a rare sighting. 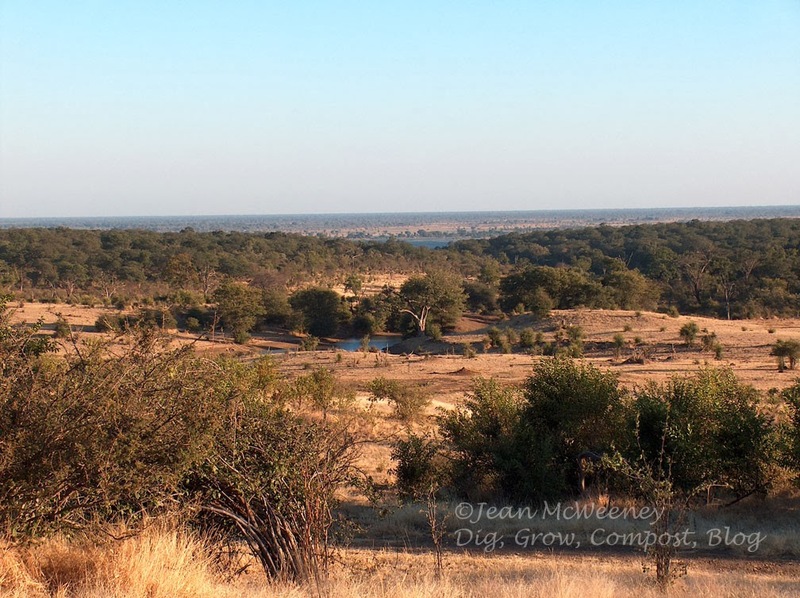 After our morning game drive we were driven back to the Kasane airport to meet our bush pilot for the next leg of our trip, a visit to Chitabe Trails Camp (now known as Chitabe Lediba) on an island in the more southern end of the Okavango Delta. But that will have to wait for another blog post! Jean, I enjoyed this so much. 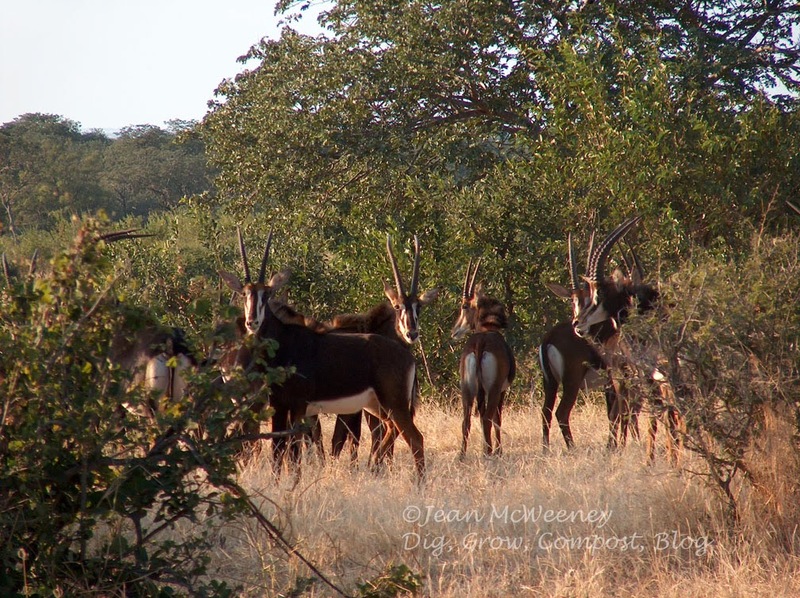 The scenery in South Africa looks pretty similar to what we saw in Tanzania, but you saw some animals we didn't, like the sable antelope. What I'm most struck by is what a tiny tour group you were in -- I bet you got a lot more input in what to see and do since your group was able to fit in just one car (if I'm reading it right). Looking forward to your next posts. 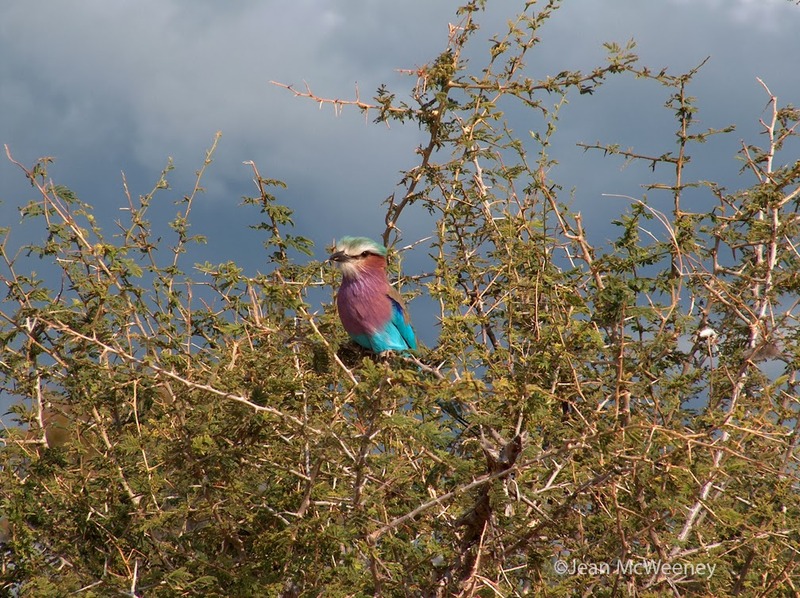 And you are absolutely right -- a photo safari is the trip of a lifetime. I think of mine often. Pam, you're right about the tiny tour groups. 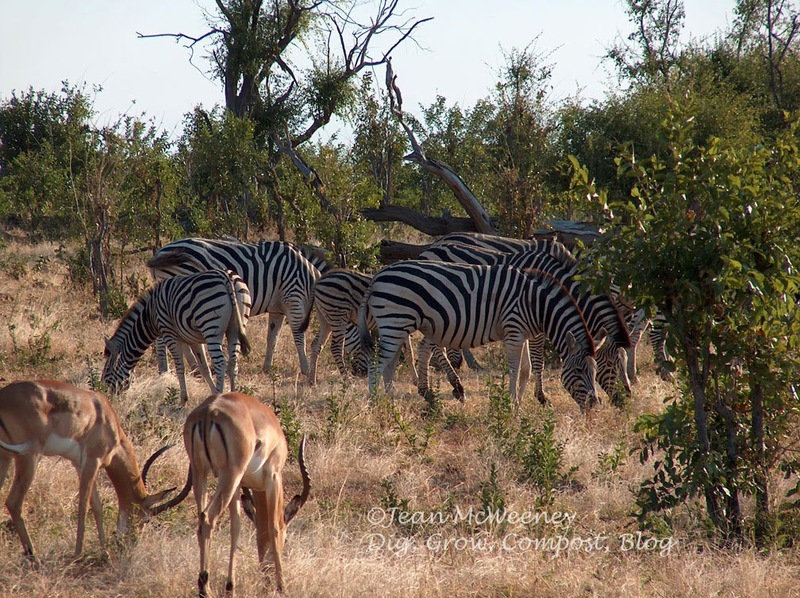 What we did was work with a travel agent who specialized in Botswana and surrounding countries. He created the itinerary and we flew in tiny planes to the other two camps. So we really weren't with the same people from camp to camp. I think the largest group at one camp was maybe 10 of us, but in our jeeps we usually had just one other couple. You have some gorgeous pictures here. I am sure this was quite the trip of a lifetime. Thank you for sharing the photos. Will you go back? Layanee, I would go back in a heart beat if I could afford it. I had hoped to go back when I turned 60 (this was also my 50th birthday treat to myself) but instead I decided to retire at 60 (turned 60 in November and will retire in two months, woop!). What a wonderful trip, I enjoyed seeing some of it through your eyes. It looks as though it was a very personal one for you. It was indeed personal for me. 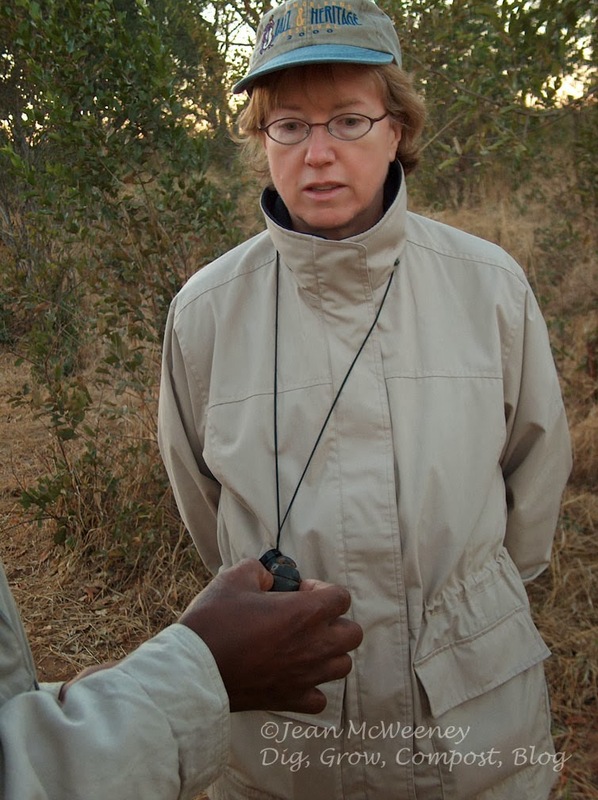 I had dreamed of visiting Africa since I first read about Jane Goodall's research in National Geographic in the 60's. What an adventure this must have been, Jean! This certainly looks like the trip of a lifetime. 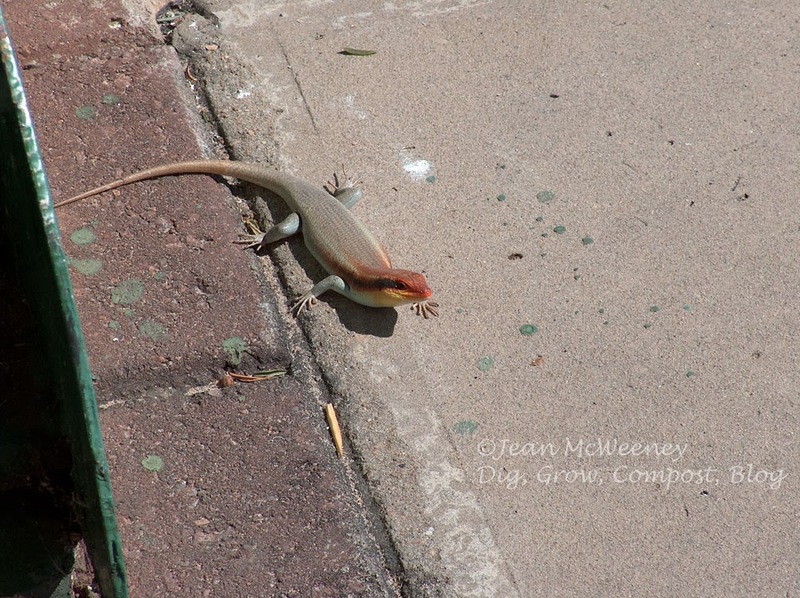 The countryside is beautiful, and seeing all these animals up close--wow! 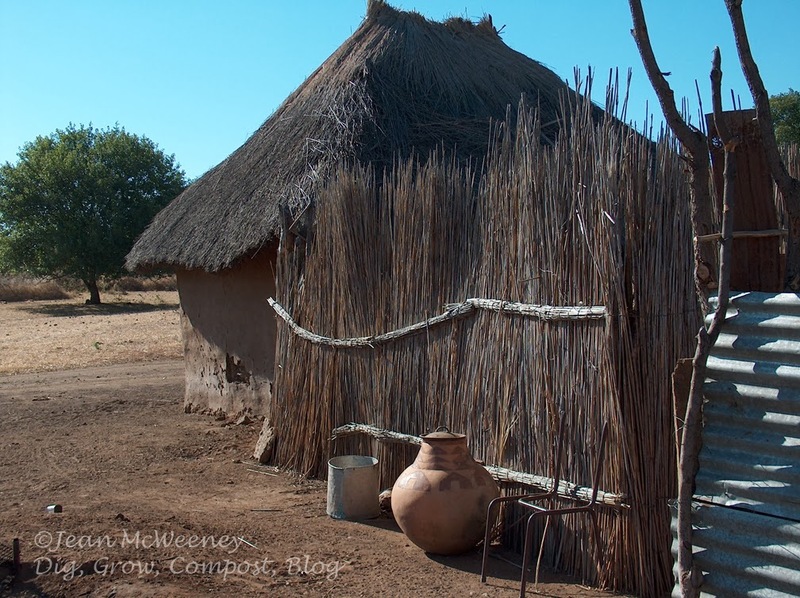 I don't think I'm brave enough to venture to Africa, so I'll just enjoy the trip virtually through your photographs. 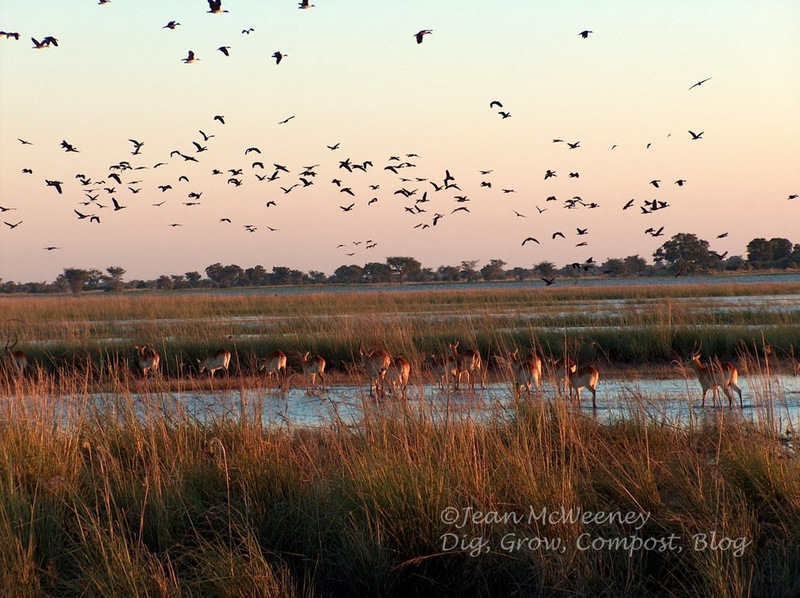 Botswana is a beautiful country, as are its people, Rose.